Bid board update Monday, August 29, 2016 at 10:30 am. Bid board update as of Sunday, August 28, 2016 at 2:30 pm. The cattle barn is in full swing and the set is always available for viewing. If you haven't yet made your plans to swing through and check out the offering this year you should. Bids close Sunday, September 11th at 6:00 pm. If you have questions contact Tim or Kyle. While your in the area you can also check out other great offerings all within a 30-40 minute drive. 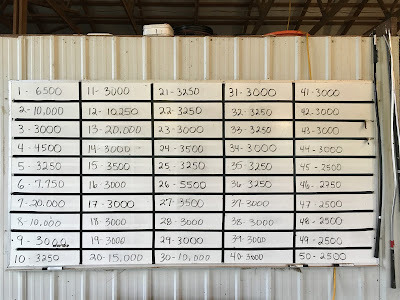 Bid board update as of Saturday, August 27th at 10:30 pm. The barn is open and cattle are ready for your viewing. Contact Tim or Kyle for questions. Bid board update as of Saturday, August 27, 2016 at 10:00 am. It looks to be a great weekend to stop by the farm and check out the set. Give us a call if you have any questions. Bid board as of Friday, August 26, 2016 at 12:30 pm. Bid board as of 11:30 am on Thursday, August 25, 2016. A look at the bid board on Tuesday, August 23, 2016 at 11:30 am. A look at the bid board as of August 21, 2016 at 12:50 pm. 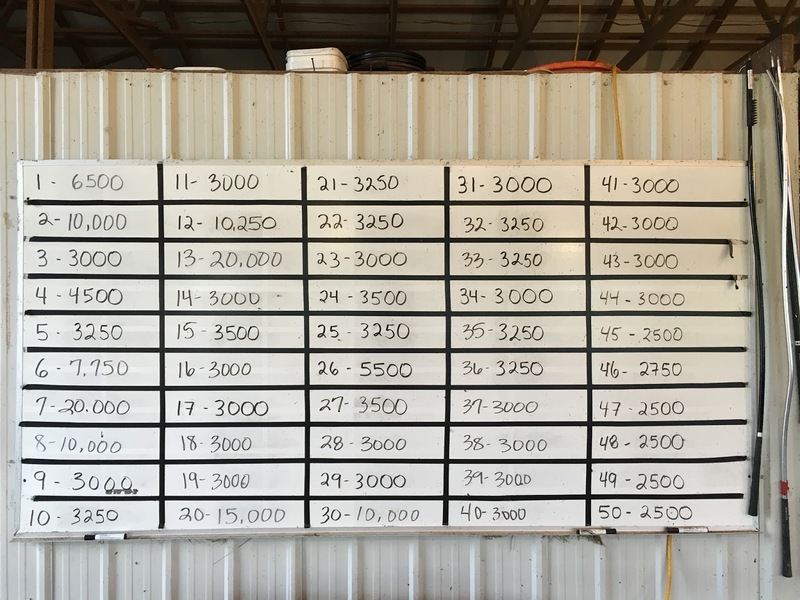 A look at the bid board as of 1:00 pm Thursday, August 18, 2016. 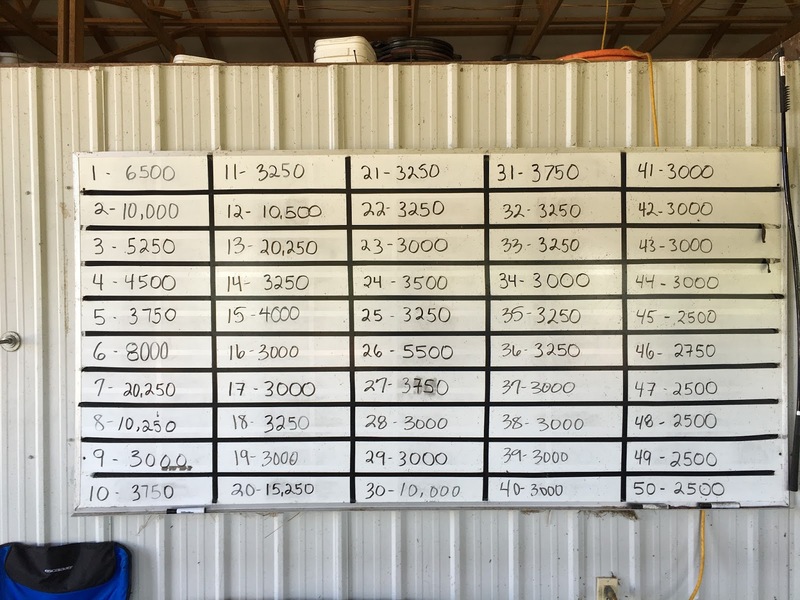 A look at the bid board as of 7:00 pm Tuesday, August 16, 2016. We will update again Wednesday evening. Dam was Champion Female at Louisville and Junior Nationals. Dam sold for $65,000 and was National Champion Chi Female in Louisville in 2013. Dam was Champion Bred and Owed Shorthorn Junior Nationals and Champion Shorthorn Iowa State Fair. Full sib to Supreme Heifer at Hoosier Beef Congress, Kentucky Beef Expo, Kansas Beef Expo, and many time champion of Stewart Skiles and Clayton Main. Full sib to Luke Elder’s 2012 Supreme Female in Louisville and Who Dat Lady the dam of Lot 2, 31, and 33. Full sib to Kennedy Core’s Supreme Female in Kansas City and Louisville. Full sib to 2010 Louisville Supreme Female and last year $90,000 high selling female. Dam was champion Female in Louisville and Jr Nationals. Full sib to Katie Mize's many time Champion this past year! Full Sib to the high selling many time champion female of Green Oaks . Dam was champion Female in Louisville and Jr Nationals. Full sib to Katie Mize’s many time Champion this past year! Grand Dam was our past $30,000 high seller and Supreme Female in Louisville for Nick Sullivan. Maternal Sister too Sander’s High Point Indiana Female 2014 and Collin’s 4th Overall Heifer Maine Jr Nationals 2015. Grand dam is the over 1 million dollar producing dam of many past champion females. Maternal Sister to the Supreme female at KILE as well as the calf champ heifer in Louisville. Maternal Sib to the Champion AOB in Louisville last year. Full and Maternal Sibs to Champions at Iowa State Fair and Junior Nationals for the Skiles and Sullivan families. Dam was the $61,000 half interest high seller at Frozen Gold. Dam sold for $30,000 and was 3 rd Overall Hoosier Beef Congress and 4 th Overall Purdue AGR. Full sib to 2016 NWSS Grand Champion Horned Hereford and Res Division Horned Heifer at Junior Nationals. Dam was a $20,000 sale feature and multiple champion in 2014. Dam was $34,000 high seller and Champion AOB KILE. Grand Dam was the $24,000 high seller and Supreme female Hoosier Beef Congress and Reserve Female in Louisville. Dam sold for $65,000 and was the National Champion Chi Female in Louisville 2013. Full and half sibs have won divisions at the 2016 and 2014 Angus Junior Nationals. Full sib to Who Dat Lady, Luke Elder’s Louisville Supreme Heifer and many more. Dam was many time Chi Champion for Tyler Dawson. -Initial bids must be in by Sunday, September 11, 2016 at 6:00 pm. 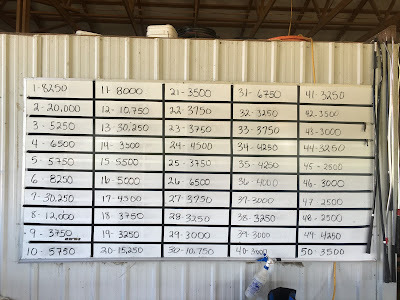 -Calves will be bid-off by phone starting shortly after 6:00 pm on Sunday. 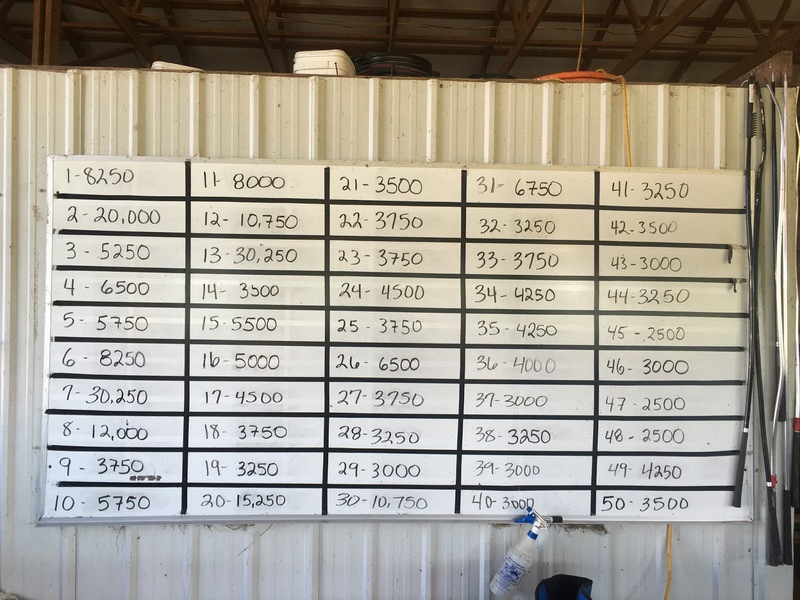 The highest price on the bid board will be first calf bid off. -All calves must be picked up within 2 weeks of the sale unless other arrangements have been made. -All calves were vaccinated with Pyramid 5 + Presponse and Caliber 7. All heifers were calfhood vaccinated and will receive Express 10. 2. 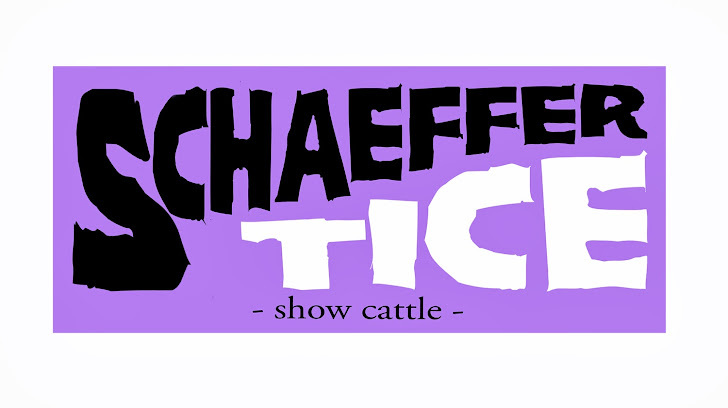 Each animal will be charged $125/day while attending shows with Schaeffer Show Cattle. This will cover all expenses while at shows. 3. All Animals must be insured during their time in our care. 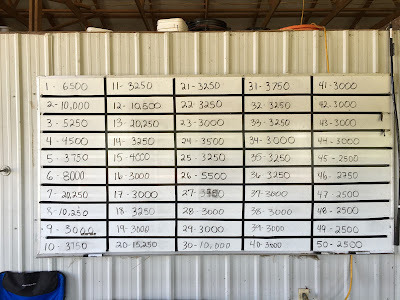 It seems just like yesterday we were gearing up for the 2015 Schaeffer Tice Pasture Sale. However, a lot of great memories have happened within the last year. We are excited to present to you the 2016 Schaeffer Tice Pasture sale set for Sunday, September 11, 2016. The crew in the barn has been hard at work since early June preparing this years group. We have come to love this set of cattle and we believe it could be another great run at the shows this year. Pictures have started to go up on the Schaeffer Show Cattle webpage (www.schaeffersimmentals.com). You can find information under the "For Sale" tab. While you are there check out the "Previous Winners" and "Donors" tabs for more information on our program. We will be posting the remaining pictures on cattle on the website in the next few weeks. Bids close this year at 6:00 pm on Sunday, September 11, 2016. We will then phone bid them off starting with the highest bid on the board. We will post daily updates of the bid board through the blog. As it gets closer to September 11th we will update more than once a day. The barn is open and the cattle are available for viewing. If you should have any questions, would like to discuss the cattle further, or need to make arrangements for viewing the cattle please feel free to contact Tim Schaeffer or Kyle Lemmon. As always we appreciate most importantly our customers. We thank you for believing not only in us, but also our program. From the Schaeffer Tice Crew- Cheers to best one yet.